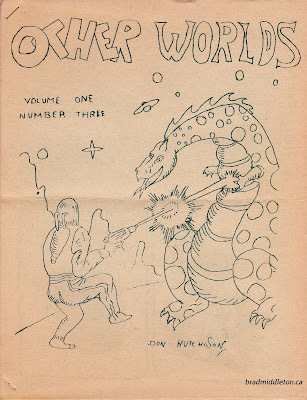 In December, 1966, in a room at the back of Viking Books on Queen Street, four SF fans--Peter Gill, Mike Glicksohn, Maureen Bourns, and John Mansfield--formed The Ontario Science Fiction Club. George Henderson was the owner of Viking Books, and when he moved locales to Markham Street (renaming his store to Memory Lane in the process), OSFiC tagged along--and quadrupled their membership by the second meeting. They soon outgrew the back room at Memory Lane, and over the years as their numbers increased, decreased, and increased again, they held monthly meetings at various locations across Toronto. The group spearheaded several conventions, including Fanfair I-III and Torcon 2, among others. They ultimately disbanded in late 1984. As it turned out, the 40 publications purchased were from 1971 through 1984; not a complete run, but certainly a healthy sampling. 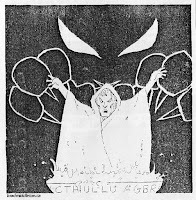 I managed to glean some very useful information about Toronto-based clubs that I had been researching, including the Canadian Count Dracula Society, the Fantastic Film Society, and the DRACO Film Society. As expected, most of the art published was traditional SF/F, although there was a handful of darker images which I've reproduced below. The first OSFiC publication dates back to January, 1967, which was a simple one-page newsletter; it wasn't long before it blossomed into a full-fledged genzine/clubzine that featured artwork and writings by its members. 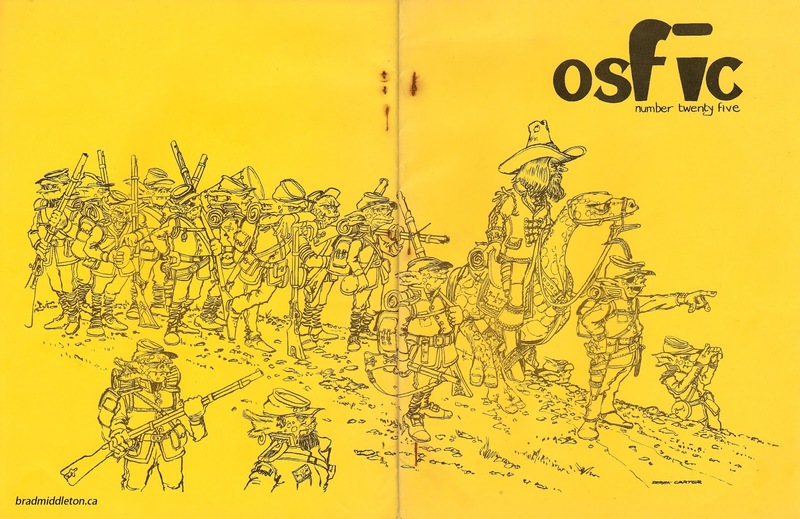 The earliest issue I have is OSFiC 25 (c. August 1971), which was the last of the original fanzine run as edited by Peter Gill. The wrap-around cover art, shown below, isn't really dark fantasy, but it's such a cool piece that I wanted to show it off. 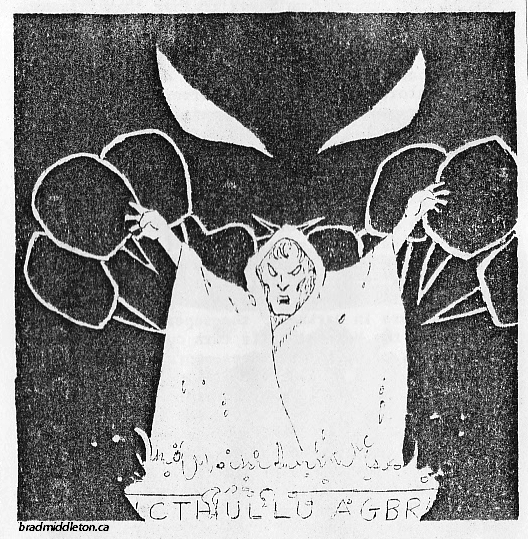 The artist, Derek Carter, emigrated to Canada from England in the late 1960s, and he soon began lending illustrations to several Toronto-based fanzines and prozines. Based on this sample of his work, it's easy to see why he became one of the most well-known fanartists during this period. 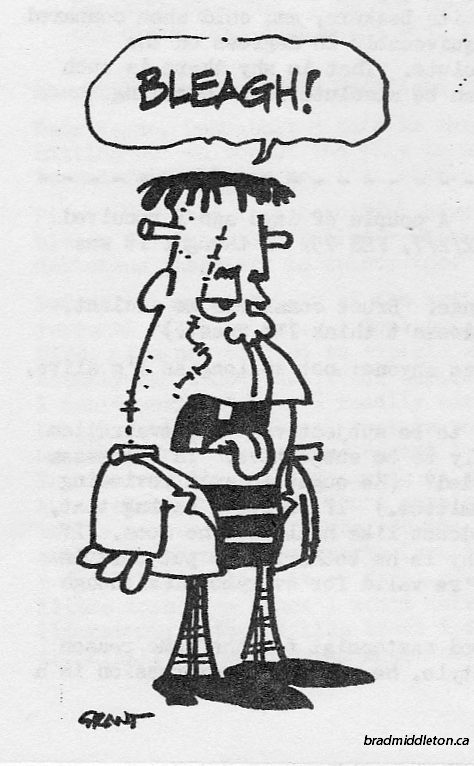 The time and effort required to produce such an elaborate fanzine, before the age of personal computers, often led to extended delays between issues--resulting in many complaints because it was supposed to be produced monthly as it also included membership news and other OSFiC business. 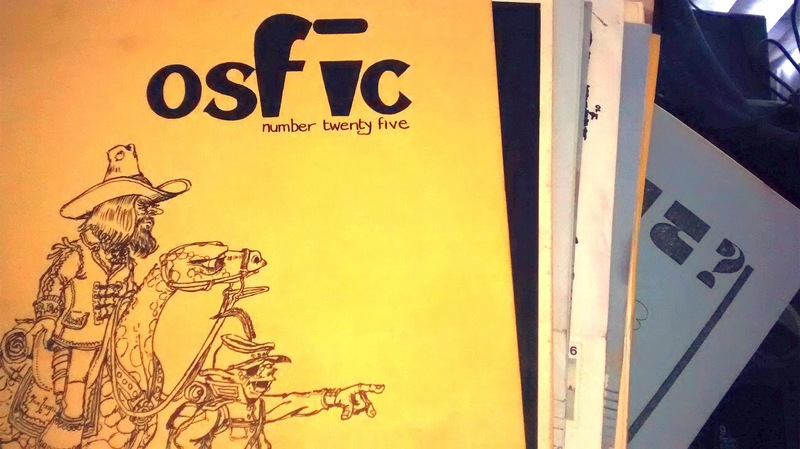 It was then decided that the club would produce two separate publications: a monthly newsletter, OSFiComm, and a quarterly fanzine, aptly titled OSFiC Quarterly. After further delays plagued the production of the first three issues of OSFiC Quarterly, it was decided to stop publishing a regular fanzine altogether and replace it with a series of single (one-shot) themed fanzines--more on that later. As for the newsletter, OSFiComm, it was first edited by Gar Stevens (who may in fact be Garfield Reeves-Stevens, although I'm not 100% certain). Soon, however, he was unable to keep up with a monthly schedule, so editing duties were passed along to Gordon van Toen. The newsletter then ran more or less steadily until January, 1974. For the next decade, until the demise of the group, a series of other editors were involved, and the name of the newsletter changed along with them. 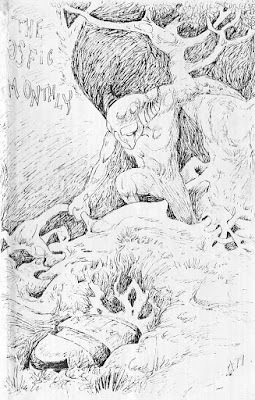 Grant Canfield, who illustrated the middle image above of the Frankenstein Monster, was nominated for the Hugo award for Best Fan Artist every year from 1972-78, although he never took home the title. Other artwork of note includes the cover of Synapse 8, shown below, by American SF/F artist George Barr. 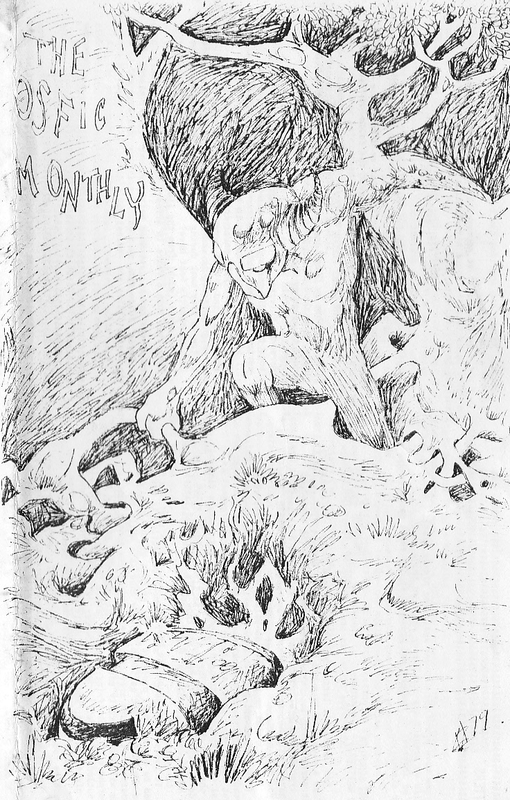 He got his start by contributing illustrations to popular fanzines in the 1960s-70s, and he too was nominated for Best Fan Artist at the Hugos several times over the years--ultimately winning the title in 1968. 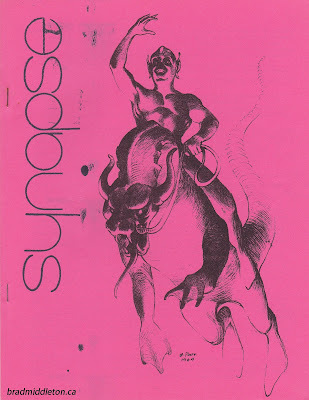 Here's another interesting cover from one of the later incarnations of the newsletter; the artist is unknown, but it was probably David Starr. 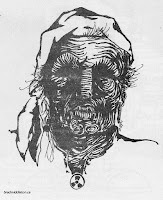 This final piece of art has nothing to do with horror or dark fantasy, however I'm including it because of the illustrator, Don Hutchison, who was one of the original forces in early Toronto fandom beginning in the 1940s. 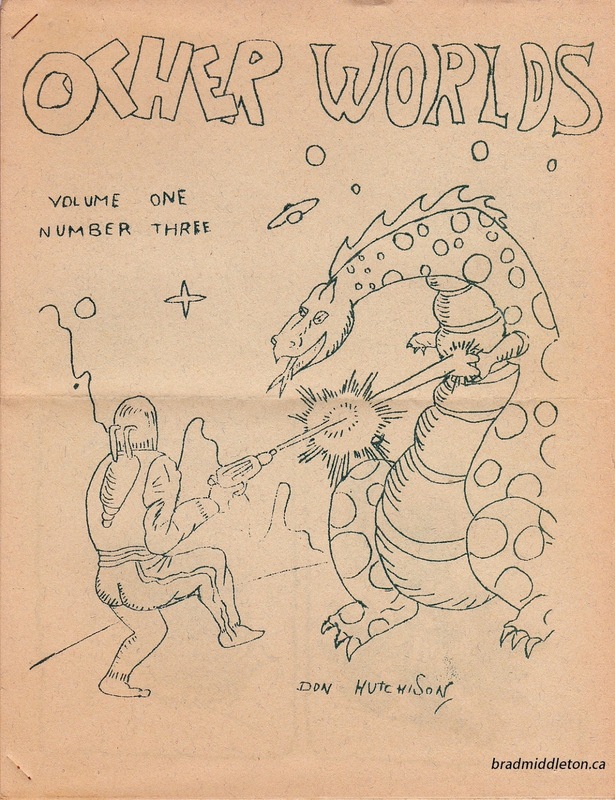 This work was reproduced in Ishue 2 (Jun 1978), and is likely the cover of Other Worlds 3 published by Paul D. Cox in 1948. 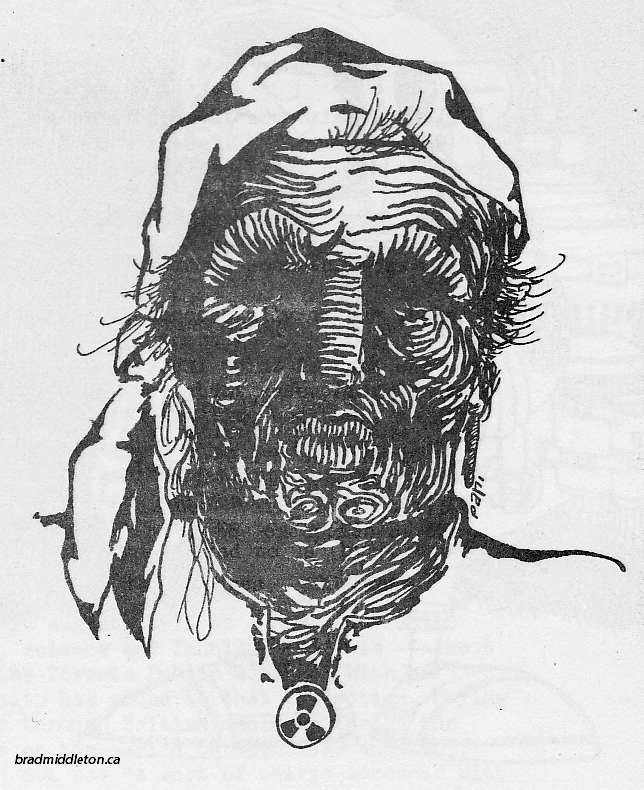 Hutchison published his own weird fanzine, Macabre, in the late 1940s, and would later create the first ongoing book series that celebrated Canadian horror short fiction--Northern Frights. I'm happy to report that these four rare fanzines were included in the lot I purchased, so I'm sure I'll blog about them separately at some point. I should also note that these publications once belonged to Peter Fitting, who was associated with OSFiC during this period and ran SF writing workshops for the group. He was also Director of the Cinema Studies Programme at the University of Toronto, an associate professor of French, and a former chair of the Society of Utopian Studies. This collection also gives an inside look at the up and down nature of the group itself, the challenges it faced, and the internal conflicts that plagued it over the years. I'll be writing about this in further detail in The Great Fright North, as part of my look at Canadian fandom and fan conventions. Stay tuned!